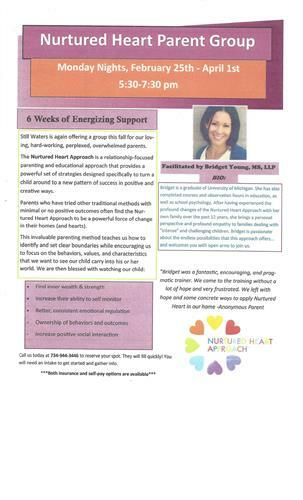 Still Waters is again presenting the Nurtured Heart Parent Goup. The sx week group is a relationship-focused parenting and educational approach that provides a powerful set of strategies designed specifically to turn a child around to a new pattern of success in positive and creative ways. If you are interested in this group, please contact Still Waters Counseling for an intake. 734-944-3446. *must have an intake before beginning of group to participate.